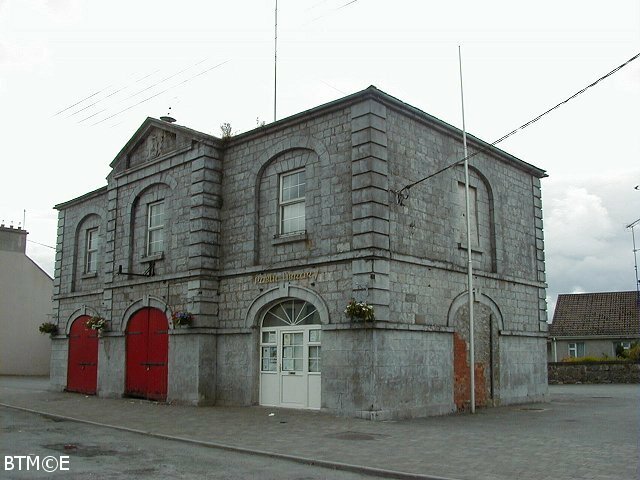 Ballymahon Market House, Co Longford (N156572) is a three-bay two-storey building with the central bay breaking forward. The pediment bears a coat of arms featuring an eagle with a griffin in the crest. Clontuskert Friary, Co Galway (M857258) has a magnificent pointed west doorway. It is flanked by two finials carved with animals, possibly dogs, and angels. The tops of the finials are tied together by a long ribbon with an inscription. The point of the doorway is topped by a central finial. The space thus created above the doorway is filled by carvings of four saints: St Michael, St John, St Catherine and St Laurence. St Michael carries a scale to weigh souls and beneath the scales is a devil trying to tip the scales in his favour. There is a creature beneath the other side of the scale but it cannot be identified. Flanking the doorway are several carved panels including a monogram knot, a star, a mermaid holding a star, two intertwined beasts, two other beasts, a pelican feeding her young and a very fine rose. Inside the doorway is a holy water stoup under carvings of St Catherine and St Laurence. The church has a north transept with a three-light traceried north window. There is a very fine three-bay vaulted rood screen. It has been much restored but a lot of the original structure is still evident. The bases and capitals of the arcade have some carving and there is a rose at the centre of each of the vaults. A south window opens beneath the vault and it bears a carved triangular knot. There is a very fine five-light traceried east window in the chancel. In the south wall is a tomb-niche with a decorated hood. There were three decorated finials but only the right and centre finials remain. At the base of each of the outer finials there is a flat carved mask. On the hood there are four panels. Three of them are roundels and the fourth is a sprig of foliage. One of the roundels has a round interlaced knot. Beside the tomb-niche is a sedilia, which is encroached on by the tomb-niche. There is also a piscina with two quatrefoil basins. Also in the south wall are two plain round-headed lancets. There is a fragment of a lancet in the north wall, which had some decorated moulding. There are traces of lancets in the east wall, which were replaced by the large traceried window. There is a memorial dated 1646 in the south wall with raised lettering. To the south of the church the north arcade and part of the east arcade of the cloister has been erected as well as several other fragments. There are some carvings in the cloister including a mask, a dog and two very small masks. The building to the east of the cloister had fireplaces at the ground and first floors. St Baedan (d.809) founded a monastery here but there are no remains. The Augustinians arrived in the 12th century and the church was built in the 13th century. The monastery was completely burned in 1413 and most of the present building dates from the later 15th century reconstruction. The west doorway was erected in 1471 by Matthew MacCraith and Patrick O'Neachtain. After the Dissolution the monastery was passed to the de Burgos. 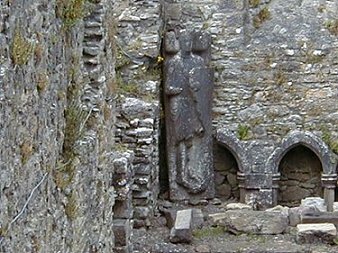 Kilconnell Friary (M733314), Co Galway, has a finely moulded west doorway topped by a three-light traceried window. There is a small south doorway. In the north wall of the nave is a very fine tomb with five saintly weepers. There is an excellent flamboyant traceried hood flanked by two finials. These are richly decorated with figure carvings. In the centre surmounting the hood are carvings of St Francis and possibly St Laurence. The nave has a south aisle of two bays and there is a south transept, which has a west aisle also of two bays. The transept has an east chapel, which has a double piscina with round basins. The transept has a three-light traceried south window. There is also a double piscina with quatrefoil basins in the east wall. There is a tall central tower possibly five storeys high. It rises the full width of the church until the apex of the church roof where there is a fine vault. Above the vault are three more narrow storeys. There is a crenellated roof. A spiral stairway rises on the north side of the tower to above the vault but it is not now accessible. Underneath the vault is a carved owl. There is another fine traceried tomb in the north wall of the chancel but it has no weepers. This was erected by the O'Daly Family. Beside it is a plain tomb-niche with another opposite it in the south wall. There is a fairly simple four-light east window and a good memorial with raised lettering of 1674 in the north wall of the chancel. The cloister to the north of the church has the east arcade and part of the south arcade in place. Many of the stones in the arcade bear masons' marks including a fleur-de-lys) a letter L and a small leaf. The small room to the north of the chancel is called the guardian's room. Within it is a very fine memorial panel bearing a coat-of-arms and a raised-letter inscription. It is dedicated to the Trimbletown Family and is dated 1667. St Conall founded a monastery on this site in the 6th century. In 1353 William O‘Kelly, Lord of Hy Many, founded a new friary for the Franciscans. The tower is a later addition which tradition says was built by the daughter of the founder. The friary was suppressed in 1541 but the church was repaired by the Catholics in 1604. It was besieged by Cromwell in 1650 but the friars were not expelled until only a few weeks before the Battle of Aughrim in 1691. Kilfenora Cathedral (R183940), Co Clare, is on the site of a monastery founded by St Fachtna. Little is known of its history but it was burned in 1055 by Murtough 0 Brien. The first bishop dates to 1189 and parts of the church were built at that time. The west end of the church is still in use. There is a fine mask outside the south door. The east end of the church is ruinous but there is a good east window of three round-headed lights. The tops of two of the columns of the window are decorated; one has foliage and the other has faces. Flanking the window are two effigy slabs. One has a cleric with mitre, crosier and raised hand; the other figure holds a book. Along the north wall is a triple sedilia with a fine hood and a good mitred head above it. Close to this is the figure of another cleric incised on a slab. In the south wall is a good double piscina. There is a small north transept with a double piscina in the east wall and a fine round- headed east window. The Doorty Cross, just to the west of the church, shows a bishop with crosier on the east face. It is flanked by two winged creatures. Beneath it are two other figures also possibly bishops with crosiers and below them possibly a double headed bird. On the west face is a Crucifixion surrounded by birds and below it possibly the Entry into Jerusalem. However the cross is covered with lichen and this makes viewing and photographing of the images almost impossible. A short distance northwest is another cross with interlacing. About l00m to the west of the church is a tall slender cross with a Crucifixion on the east face and a variety of geometrical and interlaced ornament elsewhere. Smithstown Castle (R148941), Co Clare, has now been fully restored. It appears to be five storeys high (possibly six). The top storey appears to be a complete restoration, with false bartizans and machicolation. Some of the original slit windows are visible. One of these has an ogee head decorated with a triangular knot and a small roundel. The building is now privately owned and the interior is not accessible. Leamaneh Castle (R235936), Co Clare, is still not open to the public. It consists of a five-storey tower built about 1480 with a four-storey mansion added in the 1640s. The doorway to the tower is in the east wall and was protected by a machicolation, remains of which can be seen at roof level. It is lit throughout by small slits, many of which have slop stones. There is a very good murder-hole. To the right of the doorway is a large guard chamber and the spiral stairway rises on the left. There are good slop stones under the windows of the stairway. There are also small hinge-stones here, probably for shutters. There are many examples of the large "hanging-eye" hinge-stones throughout the tower. There is a vault above ground floor and above the fourth floor. There is only one small room at each level. One of the corbels, which supported the second floor, has a decorative knot. Others have pecked decoration. There is some knot-work on the outside of some of the small windows as well as some rosettes. The doorway ahead leads to the large 17th century house of four storeys, which has many large mullioned windows and a very fine wall bartizan at second floor in the SW corner. All the windows have square hood moulds. A projection at the NW may have held the stairs but there is no visible proof of this. There are fireplaces at the west and east walls of the mansion. The front doorway is in the middle of the south wall. Carron Church (R240974), Co Clare, is a good example of a medieval parish church. A church was built here about 1200 but most of the ruin dates from the 15th century. There is a south doorway and two good windows in the south wall within deep recesses. The single light east window has a transom. The east end of the church is very overgrown with ivy and possible details are hidden. The church appears to have had an upper storey at the west end and there are remains of a bartizan at the north west corner. Poulnabrone Dolmen (M236004), Co Clare, is a very simple structure. There are three side stones on each side, a back stone and a low door stone. A large capstone covers the burial chamber and there is a smaller capstone now resting at the rear out of position. It is surrounded by a low cairn of stones which may be all that remains of a covering cairn. Excavations revealed the disarticulated bones of 16 adults and children. Temple Cronan (M288000), Co Clare, is dedicated to St Cronan of Roscrea or Tuamgraney. This small rectangular church possibly dates from the 12th century. The original entrance in the west wall was a simple lintelled doorway with inclined jambs. It is now blocked. A new pointed doorway was inserted in the north wall in the 15th century. There is a simple round-headed east window. The inner embrasure is lintelled and has inclined jambs. The church has a high pitched roof with corbel stones at the corners. Low on the west wall is a very fine mask with a much-weathered mask high up on the gable. There is another mask at roof level in the south wall and a fourth mask above the north doorway. On the inside of the north wall there are two projecting stones. One of these has a very simple mask, possibly animal and the other seems to be a weathered human mask set upside down. The church sits within a small irregular enclosure. Close to the southeast corner is a tomb made from two large slabs leaning together and two triangular end panels. A short distance to the northeast, just outside the enclosure, is a similar, though smaller, tomb. Tullycommon Wedge Tomb (R273958), Co Clare, is aligned approx SW-NE. It is a box structure with two long side stones and a capstone. At the rear two shorter side stones flank the back stone. Just beyond the end of the chamber is an outer back stone. The outer wall is well represented on both sides and there are several facade stones in place. The tomb is set within the remains of a small cashel and there is a large amount of smaller stones lying around. However, given the nature of the terrain, these smaller stones may not be part of an original cairn. Parknabinnia Wedge Tomb (R265935), Co Clare, is another box structure. It is simpler than the tomb at Tullycommon. There are two long side stones, a back stone, a broken door stone and a large flat capstone. The capstone is covered with rubble and sod. There is a large amount of cairn material close to the tomb but it is probably unconnected with it. Kilnaboy Church, (R271916), Co Clare, is a medieval church dating from the 16th century and probably earlier. It was repaired in 1715. The large rectangular church has a large cross-of-Lorraine detailed in raised stonework on its west gable. This probably dates to the early 13th century. There is a good sheila-na-gig above the south doorway. Just inside the door one of the stones forming part of the left jamb has a grotesque carving, possibly another exhibitionist figure. The mullioned east window has four lights below the transom and a traceried three-light section above. There is a plain tomb niche in the north wall with a triangular hood. The tomb niche in the south wall has a Crucifixion dated 1644 and a raised letter inscription. There are two large pointed windows in the south wall. One of the gravestones within the church shows a small figure holding a trident. Is this possibly a rare depiction of the Devil on a gravestone? Just to the north of the church is the overgrown stump of a Round Tower. Dysert O Dea Church (R282848), Co Clare, stands on the site of an Early Christian monastery, which was founded by St Tola who died about 735. The long nave-and-chancel church has a long round-headed west window, a plain chancel arch and three lancet east windows. There are also small lancet windows in the north and south walls. The crowning glory of the church is the magnificent Romanesque south doorway. This has a four-order arch. The outer order is masks, both human and beasts. The second order has a triangular serrated structure. The third order has a cusped or scalloped appearance. The inner order has some zigzag decoration with small inverted masks at the ends. The inner flat surface of this arch has diamond panels with foliage in the centre. The capitals of all the columns are richly carved. The two capitals of the outer order have human masks with intertwined hair and beards. In the third order the capitals are horned beasts. The columns are all richly decorated with a variety of motifs. The doorway dates from the 12th century and was inserted in its present position when the later church was built. To the north west of the church is the stump of a Round Tower with a fine round-headed doorway. To the east of the church is a very fine High Cross. On the west face there are patterns and some intertwined beasts. There are also beasts on the two narrow edges. On the east face there is a Crucifixion in high relief and also the figure of a cleric holding a crozier. This is probably St Tola. There is an empty socket, which may have held the right arm of the cleric, which would have been raised in benediction. O Dea's Castle (R283850) has been fully restored and is now a museum and exhibition centre. It is possibly five storeys high. There is a guard chamber to the right of the entrance and a very fine spiral stairway rises on the left. The entrance is protected by a murder hole leading from the first floor and a machicolation at roof level. The castle is vaulted above first floor and third floor. At the second floor there is a good collection of fashioned stones including quern stones and millstones. At the third floor there is a good AV display illustrating the history of Co Clare. The room above the second vault has a fine fireplace. There is a three-light window in the west wall and a two-light window in the south wall. Much of this appears to be a reconstruction. The room houses a fine collection of archaeological finds. The roof and crenellations are modern. Rath Church (R270857), Co Clare, was a nave and chancel church but most of the chancel is now gone. Only the south wall remains. It had a pointed chancel arch. The main feature of the church is a fragment of a decorated window surround. This features a small carving of a sheila-na-gig, now set upside down. There is also a mitred head set into the south wall. At the south doorway is a plain but deep holy water stoop and another decorated panel. The carving is very shallow and worn and the theme of the decoration cannot be identified. The site is associated with St Blathmac, a 6th century saint, who is believed to have been a teacher of St Flannan of Killaloe. In the 12th century Rath was an important centre of learning supported by the Ui Bhriain kings. The remains of a Round Tower stood to the west of the church but it was demolished in 1838 and some of the stones were built into the graveyard wall. At Drumcliff (R239801), Co Clare, there is the ruin of a small church and the stump of a Round Tower. Nothing is known about the history of the early monastery but the site is associated with St Conald. The church has a two-light east window with ogee heads and a round-headed west window set within a deep recess. This may have been taken from an earlier church. There is a pointed south doorway. The Round Tower stands to about three storeys plus basement but most of the wall in the region of the doorway is missing. The most remarkable thing about the graveyard is the number of large tombs. There must be in excess of 30. They seem to date from the second half of the 19th century. Some of them have a pedimented front or a cornice hiding the pitched roof. In at least one of them the doorway is flanked by pilasters. At least two were used in the last 30 years. It is a remarkable collection and it seems you have to be rich (and dead, of course) to get into Drumcliff cemetery . At Ruan (R335868), Co Clare, there is a huge tomb. It is a large rectangular structure with splayed corners rather in the style of Egyptian pylons. It has a pedimented roof with an urn and a cross as finials. The doorway is now bricked up. Above it is a panel but any inscription, which it may have held, is now illegible. It stands beside the unremarkable ruin of a church. Within the church are several trapezoidal coffin lids bearing ring-headed crosses. There is also a memorial slab dated 1688. There are several other large tombs within the graveyard but they have very ordinary brick vaults. Ballyportry Castle (R300902), Co Clare, is a large rectangular tower aligned approximately E-W. The castle appears to be five storeys high with the western end rising to a further storey. It has recently had the higher section pebble-dashed and appears very white. The doorway in the E wall is protected by a machicolation at roof level. It is set within a very small bawn with two round corner flankers. The very good crenellations appear to be relatively modern. There are many small window slits, some of which have round heads, and there are some two-light windows at the upper levels. Some slop stones are visible. The castle was restored 1961-83 by Robert Owen Brown and is now a private residence. Near Boston (R380981), Co Clare, there is half a castle standing to full height. Only the north wall with fragments of attached walls still stand. It appears to be at least four storeys high with some ogee-headed windows. The top storey was lit by a two-light window set within a round-headed recess. The castle was vaulted above the ground floor and above the second floor. There may have been a half storey within the thickness of the upper vault. It stands at the north edge of a mound, the uppers levels of which presumably consist of fallen masonry. Kilmacduagh, Co Galway (M405000), is the site of a 7th century monastery founded by St Colman, son of Duagh, a member of one of the local royal families. It has a magnificent Round Tower complete with conical cap. The round-headed doorway is very high off the ground (c 8m) and the tower seems to lean slightly. It is lit by angle-headed windows at several levels and six windows at the top. The church to the north of the Round Tower is called the Cathedral. It had a lintelled west doorway, which is now blocked. It probably dates to the 11th or 12th century. This was surmounted by a three-light window. The nave of the church dates largely from about 1200. In the 15th century a south doorway was inserted and the transepts were probably built. There are many traceried windows throughout the church. In the south transept there is a three-light south window and a two-light east window. The chancel has a three-light east window and a two-light south window. There is a small north range of buildings. There is a very high plain chancel arch. To the north of the Cathedral is a small nave-and-chancel church called St John's Church. It is very ruinous and was not closely inspected. To the east is a rectangular church, which was also not closely inspected. This is St Mary's Church. The building a short distance further north has been partly re-roofed and has crenellations. This is the Glebe House and was probably the Abbot's dwelling. It was built in the 13th century. Several hundred metres to the northwest of this cluster of churches is another. This is O'Heyne's Church. It has two fine round-headed lancets in the east wall flanked by thin pilasters. The corners of the east gable also have pilasters. There is also a plain round-headed lancet in the south wall of the chancel. The south range of buildings also has some round-headed lancets. The building cannot be entered but it is possible to see that the capitals of the high chancel arch (arch missing) are richly decorated. The pillars are made from a central thick pilaster flanked by two narrow pilasters. After the Reformation the monastery passed to Richard, 2nd Earl of Clanrickarde. The little church near Kinvarra (M362104. ), Co Galway, has a date stone 1845 above the door at the base of the belfry. It is a rectangular church with a south transept and wooden framed Y-traceried windows. It is still in use. A cross on the west gable is dated 1819. Ennistymon Market House (RI32888), Co Clare, is a five-bay singlestorey building including two doorways with a louvered dormer above each doorway. Askeaton Castle (R341503), Co Limerick, was founded on an island in the River Deel about 1199, probably by William de Burgo. It is not accessible at present but the remains of its tall 15th century tower can be plainly seen from a distance. It is at least five storeys high with vaults above the second and third floors. Although it stands to full height one wall is completely gone. The Banqueting Hall can also be seen although its finer details are not visible. These buildings stand within a bawn wall and a second strong wall surrounds the island. Askeaton Friary (R340507) was founded by Gerald, 4th Earl of Desmond, about 1400. Much of the present building dates from 1420-40. It has a long church with a north transept with two-bay access to the church. This has a west aisle of three bays. The church has a simple five-light traceried east window. In the south wall are three three-light traceried windows. One of them has some cusps in the tracery. In the south wall at the east end there are several sedilias. The first is a three-seater with barley sugar twists in its dividing columns and surrounding moulding. Above it is a raised-letter inscription dated 1646. The other sedilias are in two groups of three and are fairly plain. Also against the south wall is a fine trapezoidal coffin lid with a floreated cross. There are also two tomb niches with decorated finials but otherwise plain. There are fragments of a third niche between these two. In the opposite wall there is a similar niche. The cloister, to the south of the church, is intact. Only two of the pillars of the arcade are modern replacements and the vault of the cloister walk is present. There is an incised sundial in the middle of the north range. A spiral stairway at the SE corner leads to the upper levels but is closed off at present. There is a good carving of St Francis at the NE corner of the cloister. The friary was plundered and wrecked by Sir John Malbie in 1579. It was revived in 1627 and continued to be used by the friars as late as 1714. Rathkeale Priory (R368417), Co Limerick, is a rectangular church with a vaulted room at the north. It has a simple four-light traceried east window. There was a south transept but only the arch of this remains. It is an Augustinian Priory founded in the early 13th century by Gilbert Harvey and dedicated to St Mary. It was possibly colonised by monks from Ratoo in 1210. It was suppressed in 1542 but a small colony of monks may have remained until about 1580. After the Suppression it was granted to Sir Henry Wallop. Adare Augustinian Friary (R469465), Co Limerick, is known as the Black Abbey. It was founded in 1316 by John FitzThomas FitzGerald. The buildings were begun soon after and it is now the Church of Ireland parish church. It has a very compact cloister, which may be a partial 19th century restoration. The arcade is in three groups of three on each side. At the rear is a large 19th century mausoleum built by the Dunraven Family. The friary church is still in use. The nave has a south aisle of three bays. Beside it is a fairly plain tomb niche. There are three three-light windows in the chancel. One of them is encroached on by the tower. There is a fine five-light east window. There is a piscina with missing basins and a sedilia under the tower. There is another tomb niche in the north wall of the nave and two tomb niches in the north wall of the chancel. The very narrow square-headed window in the north wall of the chancel is possibly a lepers' squint. After the Suppression in 1539 the property was leased to John Gold and others before being granted with certain other monasteries to Sir Henry Wallop in 1595. Adare Castle (R469467) is undergoing extensive renovation at the moment. It is now possible to see that it has a strong curtain wall with a large square gatehouse on the west side. There is a D-shaped tower, also along the west wall, and lesser gateways in the north and east. The River Maigue protects the castle along the south side. Just outside the wall in the west and northwest is a substantial ditch. Within the wall, along the south edge, are two rectangular halls. At the northwest corner, protected by an inner wall and another ditch, is a tall square keep. It stands to full height but a large section is missing. The first mention of the castle was in 1226 and it was already ruinous by 1329. It was repaired but damaged again by 1376. It was besieged by the English in 1580 and rendered harmless in 1599. Adare Franciscan Friary (R474467) was founded by Thomas, Earl of Kildare in 1464 and most of the building was completed by the end of the century. It was dedicated to St Michael the Archangel. The friary is very badly overgrown and a large tree grows out of the middle of the cloister garth. There are good traces of the cloister. Three sides of the arcade are more or less intact. The arcade is in four groups of three in the north and east with broad divisions between. The west arcade has no divisions. At the south range a two-storey building projects into the cloister arcade. The upper storeys of all the buildings surrounding the cloister are fragmentary. The long church has a very fine tall central tower. There is a four-light east window and a three-light west window. There is a south transept with a three bay entrance and the transept has a west aisle of three bays. There is a four-light south window in the transept and a small east chapel with a two-light window. Within it are four tomb niches. There is also a tomb niche in south wall of the transept. There are three tomb niches in north wall of the nave and three more in north wall of the chancel. In the south wall are two more niches. All niches are fairly plain with finials. There is a triple sedilia in the south wall of the chancel and several two-light windows. The building running along the west side of the cloister had fireplaces at the ground and upper floor and two round-headed windows in the upper west wall set within deep recesses. The friary had an outer wall of which two gateways remain. This friary was also granted to Sir Henry Wallop after the Dissolution. The church of the Trinitarian monastery (R465462) founded in 1230 and dedicated to St james. It is the only known Irish monastery of the Trinitarian Canons of the Order of the Redemption of the Captives. It is now used by the local Catholic Church. The nave of the original church is now the south aisle of the present church. The present nave was built in the 19th century. The original tower is still in place and it has a very fine vault with four masks at the springing. Two of these are human and two are grotesques. After the Dissolution it was also granted to Sir Henry Wallop. 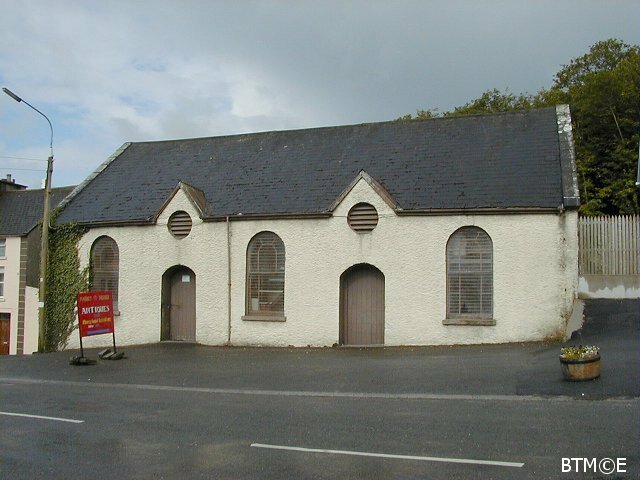 The market house at Charleville (R535228), Co Cork, is three-bay two-storey building with a pediment. The old church at Hospital (R707361), Co Limerick, was founded in 1215 by Geoffrey de Maresco. Within it are two effigy slabs. One is of a knight complete with shield. The other has a double image but it cannot be examined closely since the building is locked. There is also a trapezoidal coffin lid against the wall. It appears to have a floreated cross. 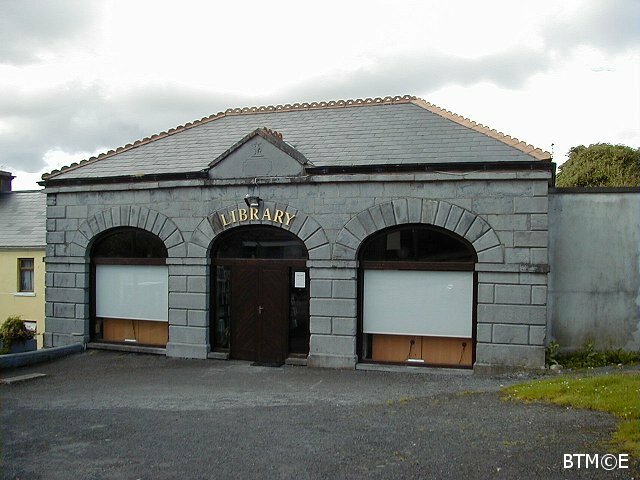 Tulla Market House, Co Clare (R493798) is a three-bay single storey building now the local library. It was built by Thomas Browne of Newgrove in 1843. Tulla also has a courthouse but it was not closely examined. by four pillars. There is a two-light south window and another tomb niche in south wall. The cloister is to the north of the nave. It is intact with arcade and vaulted walks. There are good wicker marks in the vault. The arcade has the usual dumbbell-shaped pillars in groups of two with a buttress at each division within the cloister garth. There are two-storey buildings along the west, north and east of the cloister. They have very fine vaults. Those in the north and east have fireplaces. In the west range there is an inserted mausoleum of the Butler Family. The upper storeys of all these buildings are accessible, as is the passage, which runs along the north side of the cloister. The friary sits on the foundation of an early castle, which had four large round corner towers. Traces of these can be seen particularly from the upper levels of the friary. This castle was built in 1280 by de Clare but was destroyed early in the following century after the garrison killed an Irish chief called O'Liddy. A short distance to the west of the friary is the rectangular ruin of St Finghin's Church (R417744). It was built between 1278 and 1285 and a tall slim tower in the southwest corner was added later. The north wall is missing and the east wall has a good triple lancet. Two narrow lancets in the south wall. To the south of the church is a mausoleum to the Spaight Family. Captain William Spaight died June 7 1801. An early monastery was founded at Killaloe, Co Clare by St Fachnan. He was succeeded by St Flannan who died in 639. Killaloe Cathedral (R705729) was founded about 1185 by Donal Mor O Brien on the site of an earlier church. The Romanesque doorway from this church is preserved in the southwest corner of the Cathedral. It is a four-order arch, richly decorated. The outer arch has a continuous bead-bordered chevron roll. The second arch has chevrons alternating point-up and point-down. The third arch has carvings of heads and animals but is greatly damaged and the inner arch has chevrons alternating and connected by curved rolls. The abaci are greatly defaced and the capitals below them are scalloped and decorated with animals and foliage. The first and third jambs are square in plan and are deeply carved with chevrons and notches. The second jambs afre round and are delicately carved with lozenges and zigzags. Only part of the inner jamb remains. Every unmoulded space in the doorway is decorated with a variety of foliage and animals) over 130 of them) no two quite the same. Close to this doorway is a stone with a Runic and an Ogham inscription on it. There is also a decorated font and a High Cross) which was moved to the Cathedral from Kilfenora. It is similar in appearance to the Doorty Cross but it is less complete and the carvings are not as deep. Beside the Cathedral is St Flannan's Oratory or Brian Boru's Vault. It is the nave of a small 12th Romanesque church, which has lost its chancel. It has a round-arched three-order west doorway. The capitals of the jambs have animal and foliage decoration. The church has a barrel vault above which is a croft with a pointed corbelled vault. The croft is lit by a round-headed window in the west and an angle-headed window in the east. There is a plain chancel arch. Nave has angle-headed south window. Beside the Catholic church is St Lua's Oratory (R 701729) a small nave and chancel church removed from Friar's Island in River Shannon ahead of flooding in 1930. The nave is fragmentary with lintelled west doorway. It originally had a wooden roof. There is a plain chancel arch. The chancel has high-pitched stone roof and round-headed east window with a stepped round-headed recess. There is a south doorway. An early monastery was founded at Tuamgraney, Co Clare (R637830) by St Cronan who was Abbot of Clonmacnoise and died there in 638. It was plundered in 886 and 949. Cormac 0 Cillin who died in 966 built the great church and tower. The western portion of the present church, with its lintelled doorway, may date from his time. The eastern part of the church dates from the 12th century. It has round corner pilasters with decorated capitals. High up on the east gable is a weather mask which is said to represent St Cronan. The church now the East Clare Heritage Centre. Tuamgraney Castle stands just to the north of the church. The doorway in the south wallis now blocked. There is a good machicolation. The first floor ceiling is vaulted with marks of wicker centering. A broad spiral stairway leads to roof level but is missing above the first floor. A small rectangular room may be reached from the stairway. It leads to the first floor room (floor missing) beyond which is apparently another small chamber. The rectangular chamber leading off the stairway has two small windows. Corcomroe Abbey, Co Clare (M2954090) in Abbeywest, has a long rectangular church divided by a thick wall surmounted by a slim tower. The pointed west doorway is surmounted by two tall lancet windows. At the east end there is good vaulting and the three lancet east windows are surmounted by a single small lancet. On the left is a possible double sedilia with decorated columns. Beside this is a tomb-niche with a recumbent figure. This is the effigy of Conor na Siudaine O Brien, one of the abbey's great benefactor, who died in 1267. Opposite it is another decorated double sedilia. The chancel arch has columns with decorated capitals and bases. There were north and south aisles but only the south aisle has any remains. The church had short transepts with small east chapels. There are excellent wicker-marks in the south chapel. The cloister-garth is to the south of the church but there are no remains of the arcade. There is a stringcourse on the east gable level with the window tops and at each corner is a little dog facing downwards. The abbey was called Sancta Maria de Petra Fertili (St Mary of the Fertile Rock) and may have been founded by Donal Mor O Brien in 1182. However it is may likely that it was colonised by monks from Inislounaght under the patronage of his son, also Donal, in 1195. After the Dissolution it passed through various Thomond and O Brien hands until Richard Harding acquired it in 161l. Newtown Castle, Co Clare (M217064) is a round castle on a pyramidal base. There are remains of four machicolations at roof level. The doorway is in the base of the east wall and there are some two-light windows. To the right of the doorway is a small guard chamber. Ahead is a large circular vaulted room with very good traces of wicker cantering. There, are no obvious window openings. The entrance to this room is through a door at the base of the stairs. A curving mural stairway rises to the left. It very quickly changes to a spiral and ascends to roof level. The stairwell intrudes into the rooms at each level. There is another vault above the second floor. The levels above each vault are lit by many windows. A chimneystack rises in the north wall. The castle is five storeys high. Gleninagh Castle, Co Clare (M193103) is an L-shaped building with a spiral stairway in the narrower east section. The doorway, within the angle of the L, is protected by a wall bartizan. The tower is four storeys high with round bartizans at three corners. It is vaulted above the second floor and an underground vault supports the ground floor. There are many corner defensive slits as well as other slits and two-light windows. 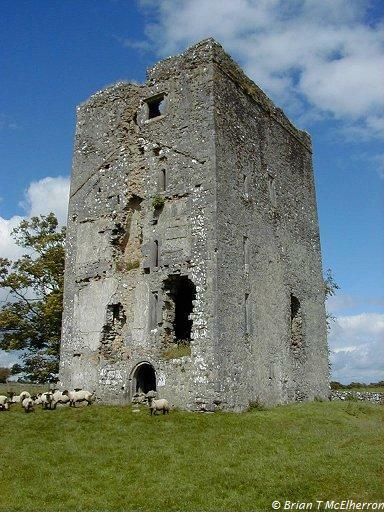 This is an O Loughlin castle, which was occupied until 1840. Nearby is a Holy well. Newtown Castle, Co Galway (M423020) in Castle Quarter, is a large round castle about three storeys high. The doorway is in two sections with a round-headed outer doorway and a pointed inner doorway. The gap between the two doors which was originally accessible from the first floor is now blocked. This was a defensive structure which performed the same function as a machicolation or a murder-hole. This double doorway leads to a lobby with a guard chamber on the right and a broad spiral stairway on the left. Ahead, through a pointed inner doorway, is a square ground floor room lit by narrow slits within deep recesses. The castle is vaulted above the first floor, which is lit by another narrow slit. This room has access from the spiral stairway. Above the entrance area there is a long curving passage which is also accessed from the stairway. The stairway is fragmentary beyond this level. The entrance is in the east and at the SW there is an exit for a latrine chute. Presumably this latrine starts from above the vault. The castle is almost covered with ivy, which masks any window details which may be above the vault. In Lydacan, Co Galway (M444079) there is a bullaun stone. It is a granite boulder with a bullaun about 40cm diameter and 25cm deep. It stands in the middle of a field beside an overgrown rath. This has a good outer ditch and a substantial inner bank and platform. A large gap in the east may be the original entrance. The platform is overgrown making estimation of size difficult however it is about 30m diameter. Near one edge are two flat slabs which seem to cover a rectangular pit. From a previous visit it is known that this rath contains a souterrain. The entrance could not be found on this occasion. The rath is labelled CBG (Children's Burial Ground) and some fragments of gravestones were noted on a previous visit. Lydacan Castle (M438080) has a doorway which is round-headed on the outside and pointed on the inside in a similar fashion to that at Newtown Castle. It is in the west wall. At the top of all four walls there are corbels which carried some form of machicolation. To the left of the doorway is a small guard chamber and to the right is a short passage, which leads to a spiral stairway, which rises to roof level. The gap between the two sections of the doorway is accessible from the first floor and presumably serves the same function as a machicolation or a murder-hole. There is also a fine murder-hole protecting the lobby. There is the usual pointed inner door leading from the lobby to the ground floor room. This is a large rectangular room, which is lit by one small slit in the south wall. A slit in the opposite wall has been partly blocked and a fireplace inserted in the wall. There is no chimney and the smoke exits via the remains of the slit. There are good wicker marks in the vault. There is a second vault above the second floor and one storey above that. The narrow western section of the castle has a vault above the ground floor, another above the second floor and another above the third floor. Thus this part of the castle appears to have five levels and the main section has four levels. At the level below the roof storey a passage runs between the larger and smaller sections to a latrine near the north west corner. The castle is lit mainly by small single-light windows with a two-light window at the first floor. There are several cross-shaped loops throughout the building. A small turret rises at the southwest corner. Nastig Fort, Co Galway (M420060), is about 30m across. It has a good substantial bank, which also contains some stone. The entrance may be in the east and in the west there appears to be a small mural chamber. There is a large amount of small stones lying within the fort. Some of this material may have lined the bank. Just off centre there is the entrance to a souterrain. Only the outer section of this was explored on this occasion. From a previous visit it is known that this souterrain contains a well and that the inner parts are not accessible. Castletaylor, Co Galway (M467142), is a tower-house which has had two large traceried three-light windows inserted in its east wall. The mullions from these windows appear to be much heavier than the tracery and do not match. The windows are said to have come from the churches at Kilmacduagh. The pointed north doorway was protected by a long narrow slit just above it instead of a machicolation. The tower seems to be about four storeys high and has a good base batter. It has a groined vault above the first floor. There is a small guard chamber to the right of the doorway and a mural stair rises to the left. At the other end of the building is a balancing tower of three storeys with gabled dormers, which have three-light traceried windows. Between the towers is a three-bay three-storey house. This is now totally gutted. The castle has a large walled garden at the rear and a little further off is another walled yard and a stable block. At Roscam, Co Galway (M343242)) there is the stump of a Round Tower with a square-headed doorway. It now has three storeys plus basement and is about 10m high. Close to it is the poor ruin of a church. A little further off is a graveyard with a fine bullaun stone with a large bullaun about 40cm diameter and a smaller bullaun. Beside it is another bullaun stone set on edge. It has three large bullauns. St Odran, son of Beoad and brother of St Ciaran of Clonmacnoise, is associated with the early monastery at Roscam. The site was devastated by Norsemen in 807, but little else is known about its history. Claregalway Friary, Co Galway (M3713334), was founded by John de Cogan about 1250 and was richly endowed by the de Feoris or the de Bermingham family. The nave of this rectangular church has a north aisle of four bays. Only the aisle arcade is still in place. The west wall of the church is also missing. The south wall is lit by four short lancets and one small two-light window. There are also three plain tomb niches in this wall and a piscina with round basins. There is a north chapel which opens off the east end of the aisle. It has a three-light traceried north window and two two-light east windows. One of these is decorated on the outside. There is also a very fine piscina. One of the basins is quatrefoil and the other is octofoil. There is also a credence table. The tall central tower has a very fine vault with a hairy mask at the centre. Some small masks at the springing of the vault. One of these is human) the others are grotesques. The north and south walls of the chancel are each lit by six lancets and there is a very fine five light traceried east window. This window was inserted in the 15th century and replaced lancet windows. In the north wall is a tomb niche with a decorated hood with a panel dated 1648. In the south wall is a piscina and a fragmentary triple sedilia. The 15th century tower rises for three storeys above the vault. The top is crenellated and there are two carved gargoyles on each side. To the south of the church is the cloister garth but there are no remains of the cloister arcade. There are traces of two-storey buildings to the south and east of the cloister but only a single wall on the west side. There is a fireplace at the upper level of the east range. Also in this range is the Ryan mausoleum from 1886, last used in 1997. One of the tombstones lying in the nave depicts, among other things, a plough. The inscription is difficult to read. There are some trapezoidal coffin lids within the church. At least two of them have floreated crosses but they are very faint. After the Suppression the friary was granted to Richard de Burgo in 1570. The friars were allowed to remain in or near the buildings but were driven out in 1589 by Sir Richard Bingham who then converted the buildings into barracks. Claregalway Castle, to the east of the friary, is currently being restored. In Tuam Cathedral (M438520) is a magnificent 12th century Romanesque chancel arch. It has five orders and is richly decorated. The decoration includes the usual diamonds, chevrons, triangles and beading as well as floral panels, but none of the masks as seen at Dysert O Dea or KilIaloe. The capitals of the pillars have human masks with intertwined beards and hair. The arch has a sixth outer order, which is narrower than the rest and does not have supporting pillars. It looks like a decorated hood mould. Also in the church is the shaft of a high cross. It is richly decorated with interlaced panels and intertwined beasts. There are inscriptions on both the narrow faces. On the opposite side of the church the Market Cross from Tuam has been re-erected. This appears very tall and is a composite of two crosses. The head is much too small for the shaft. The ringed head depicts a Crucifixion on one side. On the other side is an abbot with other figures and there are two unidentified figures on the ends of the arms. The shaft is decorated with interlaced panels and intertwined beasts. The pyramidal base has two figures on either side and at the narrow ends there are two round sockets for an unknown attachment. St Jarlath founded a monastery at Tuam in the late 5th century. In the late 12th century a Romanesque nave-and-chancel church was built and the chancel was incorporated into the Cathedral early in the 14th century. For many years it served as a porch. The main part of the Cathedral is a 19th century building. Ross Errily Friary (M249483) near Headford has a fairly plain pointed west doorway and a three-light traceried west window. The rectangular church has a south aisle of four bays and a double south transept two bays long. Both the transepts have three-light traceried south windows. The transept has a two-light flamboyant west window. There is a small east chapel with a three-light traceried window and a credence table in the south wall. The transept also has two two-light traceried east windows. In the transept there is a gravestone with a raised letter inscription dated 1690. There is a tall central tower, which has two storeys with crenellations above the apex of the church roof. The tower is vaulted at the level of a round arch leading from the nave to the chancel. Above this is another storey within the attic of the church and the free tower then rises above that. Throughout the church there are several large mausoleums. In the chancel there is a tomb niche in the north wall with finials and a few decorative rosettes. In the south wall there is a piscina. One of the basins has seven sides. The other has many sides but it is so shallow that the exact shape cannot be determined. There are several two-light windows in the south wall of the chancel. Some of them have cusped ogee heads. There is a good five-light traceried east window. The cloister to the north of the church has a ten bay arcade on each side except on the east where there are five bays separated by substantial masonry pillars and a small half bay. There are many two-storey buildings surrounding the cloister and to the north. Many of them have fireplaces but the upper floors are missing. One of these buildings has a large fireplace on the ground floor with a large oven behind it. Beside it is a deep circular stone pit, which was apparently a fish holding-tank. The friary was founded in 1351 by Sir Raymond de Burgo. After the Dissolution it was granted, with other monasteries, to the Earl of Clanrickarde. Annaghdown Cathedral, Co Galway (M2883800) has an inserted east window. It is a round-headed window with a richly decorated Romanesque frame. There are triangular panels containing mainly floral motifs and at least one beast. There are intertwined and curling beasts at the ends. Outside is a round hood mould. The rectangular church is otherwise unremarkable having a pointed north doorway and a couple of pointed south windows. To the north are several church ruins, which are totally uninteresting. A short distance to the southwest is another collection of church buildings (M28 7379). This is the Abbey of St Mary de Portu Patrum, which may have been founded by Turlogh O Conor. This has a long church with a pointed north doorway, and early round-headed north window in the chancel and a larger south window. This has a round hood mould with beastly heads as stops. To the south is a long two-storey range with missing floors and a fragmentary upper storey. To the west of this building is a rectangular open area which is presumably the site of the cloister. There are fragments of buildings to the south of the cloister garth. Within this is a collection of Romanesque fragments. This includes two pillars with diamond patterns and carved capitals which feature human faces with intertwined hair and beards. There are three other carved capitals stacked on top of each other and a shorter and plainer pillar. They seem to be part of a doorway or possibly a chancel arch. After the Dissolution the abbey was granted to Richard, Earl of Clanrickarde. Annaghdown Castle, to the south, is still undergoing restoration. A castle (M328370) was photographed from a short distance away. It is very overgrown with ivy. This is near Castle Quarter and Cloonboo. Another castle at Lackagh Bridge (M418365) stands almost to full height. It is five storeys high with a vault over the third floor. A spiral stairway rises in the north west corner. The southwest corner is very damaged. The castle was viewed from a distance and the entrance could not be seen. A series of small rooms leading from the stairway run along the west wall. A third castle (M445376) has a doorway in the southwest wall. It is a roundheaded doorway with some pecked decoration. It leads into a lobby with a guard chamber on the right. On the left a short curving passage leads to a spiral stairway. There was a vault above the first floor and there are three storeys above that. Gable marks show that there was a building attached to the SW wall but all other traces have vanished. This could be Derrymacloughna Castle. At Corrofin, Co Galway there is a castle which was viewed from the roadside. It appears to stand to three storeys with traces of a fourth storey. There is vault above the third storey. The pointed doorway is in the north east wall close to the north corner. Above this is a large gap. There is a large amount of damage at the west corner. Abbeyknockmoy, Co Galway (M506436) has a pointed west doorway which is surmounted by a single-light window with ogee head. The church had north and south aisles. Each aisle had four bays with broad dividers. Only the two most westerly arches are unblocked on each side. The cloister garth is to the south of the church but none of the cloister is in place. Fragments stored within the ruins show that the cloister arcade had dumbbell-shaped pillars. There is a good east range of buildings with fragmentary west and south ranges. The cruciform church has two east chapels in each of the transepts. There are three short lancet windows in the east wall of the chancel and these are surmounted by a single pointed lancet. There is good vaulting over the chancel. It is inaccessible at present but the wall paintings for which the abbey is famous are visible through the gate. There is a tomb niche in the north wall of the chancel. It has a large mask on the central finial and two small masks at the base of the outer finials. The chapter house had a good moulded doorway but only the lower courses remain. It was originally a large vaulted room lit by five narrow decorated lancets. An inserted wall divided the southern third of the room from the rest and encroached on one of the lancets in the process. The rest of the room was divided by a three-bay arcade which encroached on another of the lancets. The abbey was founded in 1190 by Cathal Crobderg O Conor, King of Connacht and colonised by monks from Boyle. It was dedicated to the Blessed Virgin. In 1542 the abbey was surrendered by the abbot Hugh 0 Kelly when he acknowledged the king's supremacy. Some of the property was granted to Nicholas FitzSymons in 1568. In 1584 the possessions of the abbey included 1260 acres, seven rectories and the island of clare. Tromra Castle, Co Clare (RO08732) may have had the entrance in the south wall but this section is badly damaged. However a mural stairway rises from this area with the south wall and continues to rise within the east wall. It is not accessible from the ground floor. There are large window openings in the east and north walls and the castle was vaulted above the ground floor and again above the first floor. There seems to be two more storeys above the second vault. A small turret rises above the north east corner. There may have been a bartizan at the southeast corner where some corbels are in place. There is a great deal of damage at the east wall as well and much of the batter has been removed. The castle is built of good quarried stone. Clohanes Burial Ground, Co Clare (RO07692) contains seven small mortuary houses. They are about 3m by 2m by 2m high and have pitched roofs. They date mainly from the second half of the 19th century although some of them have been recently renovated and are still in use. They are fairly plain structures and do not seem to indicate great wealth on the part of the builders. It seems to be a South Clare practice as similar tombs have been seen at Milltown Malbay, Kilmihil and Carrigaholt. They are totally unlike the elaborate tombs seen at Drumcliff. All the older gravestones in the cemetery have been laid flat. One common design, dating from the 1820/1840s has a central crucifixion flanked by 30 pieces of silver and other instruments and images of the Passion, including the cockerel, ladder, nails, hammer and pincers. A similar design, dating from about 30 years later has the Crucifixion replaced by a ring-headed cross. Carrigaholt Castle, Co Clare (Q848512), has a bartizan at the north west corner. It is five storeys high. The pointed doorway is in the middle of the east wall and is protected by a machicolation at roof level and a broad slit above the door leading from the first floor. There is a chimneystack in the north wall. The tower is very slim, being only one room thick. The doorway leads to a small lobby, which has a long murder-hole in the roof. There is a rectangular room to the right of the doorway. It has a flat vaulted ceiling and has been provided with brick shelves and niches. To the left of the doorway is a broad passage, which leads to a broad spiral stairway in the southwest corner. The castle is locked and the upper levels could not be explored. There was a building about three storeys high plus attic attached to the south wall near the eastern corner. This has now been removed perhaps because most of the ground in this area has fallen into the sea. There may have been another building attached to the north wall where there is a gable mark. Some corbel stones project from the west wall at a low level and their function is unknown. There is also a blocked doorway in the west wall. This has been encroached on by a two-light window. The castle is surrounded by a later wall with a small round turret at the north east corner. A small graveyard close to Kilmurray McMahon, Co Clare (R125565) has five mortuary houses. Two of them are small gabled buildings. One of the larger buildings had a pedimented facade. Another example of burials above ground in South Clare. One of the buildings has a modern roof. The earliest recorded burial in it is 1912 and the latest 1957. 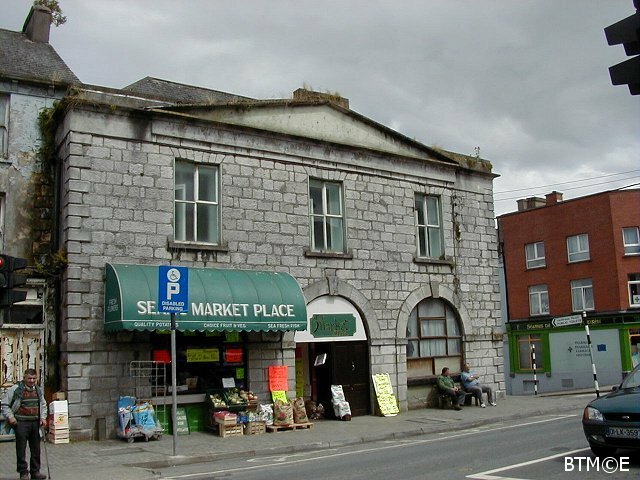 Roscommon Market House seems to have been originally a six-bay two-storey rectangular building. There is a two-storey pedimented addition at the front and the back blocking the two central bays. The front addition has a tower and a cupola. Roscommon Friary (M873639) was founded for the Dominicans by Felim 0 Conor, Lord of Roscommon in 1253. It has a pointed west doorway with fragments of a large traceried window above it. This is a 15th century insertion replacing several lancets. Traces of two lancets may be seen flanking the present large window. The church had a north aisle of four bays but only stumps of the aisle arcade pillars remain. There are lancet windows in the south wall of the nave and beneath them are several plain tomb niches. There is a short north transept. There was a large traceried east window but only fragments of it remain. There is a single-basin pisdna in the south wall of the chancel. The main point of interest in the friary is the effigy tomb in the north wall of the chancel. This shows a lying figure in a long robe with his feet on a dog. There are two panels showing eight weepers. These are soldiers wearing pointed helmets and long chain-mail coats. Seven of them carry swords and the other has an axe. This is one of the few tombs in Ireland showing military weepers. The effigy is of Felim 0 Con or and dates to the end of the 13th century. The rest of the tomb is 15th century date. Roscommon Castle (M873650). This is an example of a large keep less castle with D-shaped towers at the corners. There is a large rectangular gatehouse in the west wall. The remains of the main gatehouse are in the middle of the east wall. This building was three storeys high plus basement and had two D-shaped towers. The gap between the towers was only about 3m. There are many mullioned windows and some of the corner towers also have large windows. The castle was built by Robert de Ufford, Lord justice of Ireland, in 1269. It changed hands several times during the succeeding centuries. In the late 16th century Sir Nicholas Malby carried out extensive alterations which included the insertion of the large mullioned windows and the building of a range of buildings along the inside of the north wall. 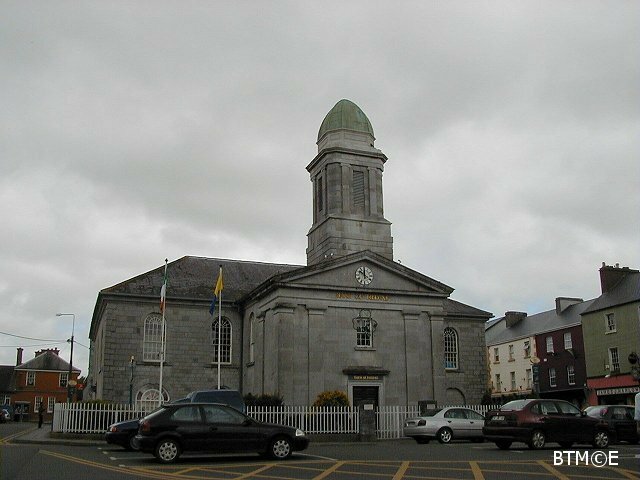 Boyle, Co Roscommon has a three-bay two-storey courthouse with two single-storey flat-roofed one-bay extensions. Boyle Abbey (G806027), or Ath-da-Larc Abbey, was colonised by monks from Mellifont in 1161. The cruciform church has a north and south aisle of eight bays. The north arcade has pointed arches and the south arcade has round arches. The north aisle has disappeared and the aisle arcade is blocked. The south aisle has been reduced to foundation level but the arcade is open. Most of the pillars of the aisle arcades are square masonry structures with round pilasters on the inside. The capitals of all the pilasters are decorated. One of the pillars in the north arcade is octagonal, the only known such pillar in an Irish Cisterdan abbey. Some of the bays of the south arcade have round pillars. Above the arcades there were small round-headed windows within deep recesses. Only a few of these are still intact. The church had a massive central tower with some masks at the upper level. The chancel has a barrel vault and is lit by three tall lancets. There are two small east chapels in each of the transepts. The cloister garth lies to the south of the church but none of the cloister remains. All the buildings along the east of the cloister are gone and only the inner wall remains. Excavation revealed the doorway into the chapter house. Only the lower courses remain but it was a five-order arch with some decoration at the base of the innermost order. Beside it was a similar three-order doorway. There was a two-storey building along the south side of the cloister. It is now used as a store for carved stone fragments. At the southwest corner is a small round turret. The lower courses of this belong to a Round Tower from an earlier foundation. The present entrance is through a small two-storey gatehouse in the middle of the west wall. The original west doorway of the church was pointed with some moulding and surmounted by a large window. After the Suppression the monastery was granted to Patrick Dusacke of Gerrardston. At Kilmore, Co Cavan (H384034) the Cathedral of St Feidhlimidh has an inserted 12th century Romanesque doorway. It was removed from an early monastery on Trinity Island in Lough Oughter. It is a four-order arch with chevron decoration. There are intertwined animals and interlaced ornament on the jambs.